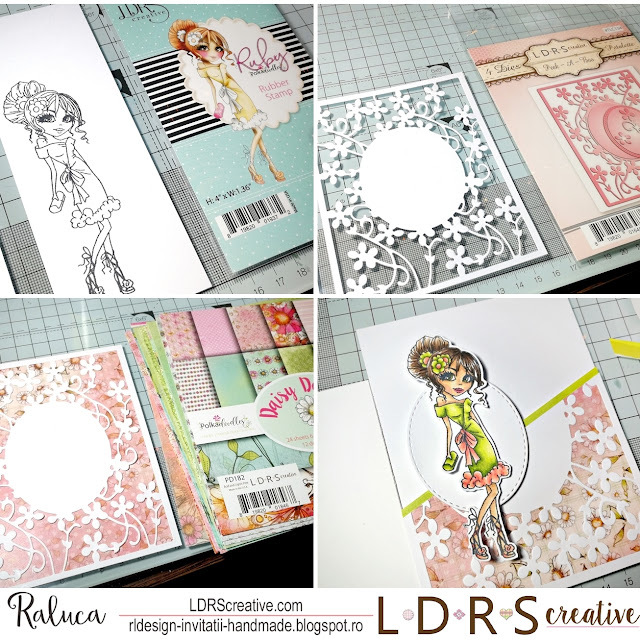 For today's project I played with the lovely Ruby - So Sassy stamp, the gorgeous Petalette die set and the fabulous Daisy Delights - 6x6 Paper pad. I've also used the Party Time stamp set for the sentiment. First I chose a beautiful pattern paper from the Daisy Delights - 6x6 Paper pad and trimmed it into a panel. Then I die cut the gorgeous Petalette die from white cardstock and glued it on to the pattern panel and then trimmed it at an angle. I adhered it on a white card base and also glued a green strip under the cutted panel. Using black ink I stamped a sentiment from the Party Time stamp set and on another white panel I stamped the lovely Ruby - So Sassy stamp. I colored it with alcohol markers and fussy cut it. Next I die cut an oval from white cardstock using the die included in the Petalette set and mounted it on the card. On the oval I adhered the colored image, then I glued a few clear iridescent jewels and my card was done. She is so cute, I like her going on a date dress! Such a cute card! I love her green dress! And fancy background! Sweet card! Ruby is adorable! Love the background too! Fabulous inspiration! Ruby is beautiful! I love this beautiful, happy cards!!!! FAbulous card design and great colors.